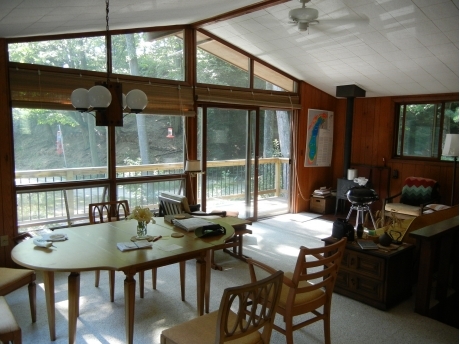 Montague Vacation Rental: Cottage on Lake Michigan- Rents Saturday 4 p.m.to Saturday 10 a.m. Attention! August 18th through 25th is the only week open until September. All of September is available. 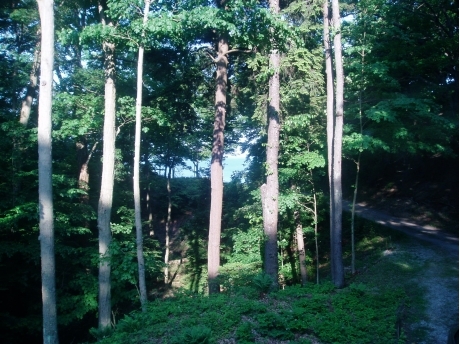 This quiet cottage in the woods has a nice view of Lake Michigan through the trees (see pictures). 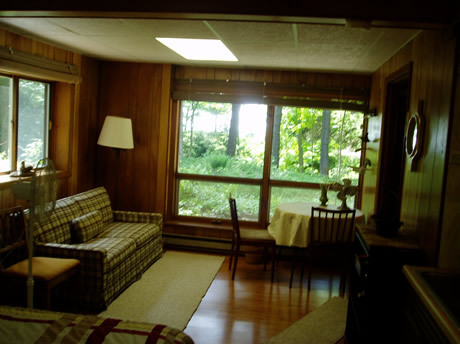 It is a short 400 ft, 1 minute walk to our private 1/4 mile long beach right on Lake Michigan! It is seven miles to the restaurants and attractions of Whitehall/Montague. The two floors (1440 sq. ft.) have sleeping accommodations for six. The cottage provides ideal accommodation overall for two adults and two children. 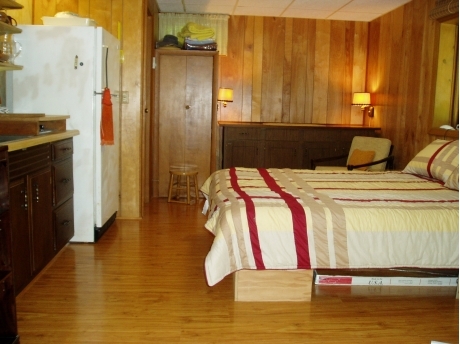 It has a kitchen, living area, Florida room, and bedroom with queen size bed upstairs, and a walk-in first floor large bedroom, with queen size bed and a sofa bed. There are two bathrooms with showers, one on each floor. 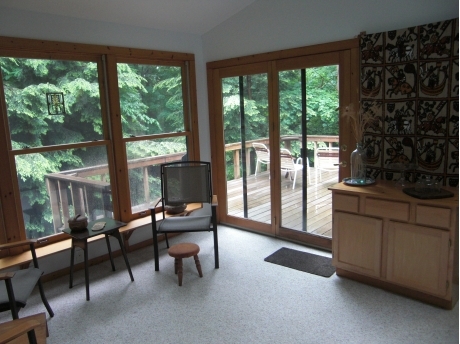 The spacious side deck is above a wooded ravine, and the recently added Florida room has 3.5 walls of windows surrounded by woods. Bed linens, towels etc. are provided. There is Wi-fi, so your devices will work.There is also an old fashioned land-line phone you can use, and the nature channel is out the window 24/7. Note!!! We only rent by the week or longer, not weekends, etc. 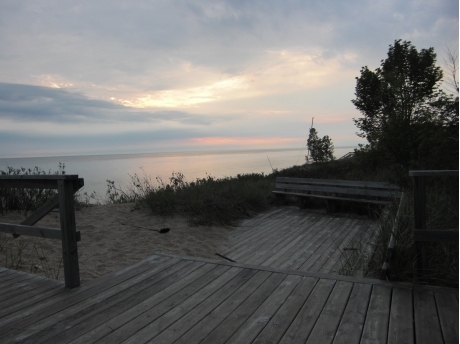 To find the cottage, take Fruitvale Road (north of Montague) west toward Lake Michigan off U.S. 31. Go several miles past a couple of stop signs to the end of the public road, where there are numerous mail boxes. Then turn right and go about half a mile along Lost Valley Road till you come to posts with nautical looking ropes on either side, and off to the right a sign that says Wintony Woods. Just a few feet before these posts, turn right up the hill about 150 feet to the first cottage (mine). On the right upper front of this brown chalet style cottage you'll see a wooden sign that says Miller. After checking out the premises be sure to take the short walk back to Lost Valley road to see the private sand beach down the steps to the beach. The address is 10304 Lost Valley Rd. Montague MI, 49437. If you google it, and see a map of the area, the red arrow/dot is not in the right spot on the map. It is actually quite a bit closer to the beach. The rental is right in the area where the road straightens out by the beach. it is to the east in the woods. It's a short walk to the beach. It's hard to tell from the pictures, but the beach is right there! 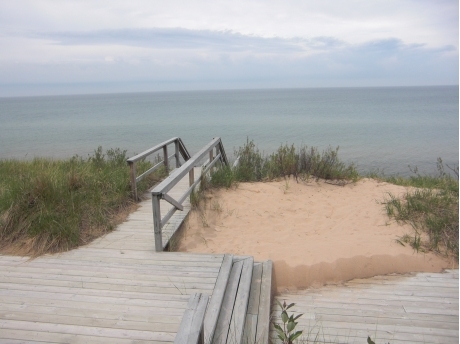 As guests at Wintony Woods neighborhood, you can enjoy exclusive use of the Wintony Woods beach, and of course Lake Michigan. This private beach is over a quarter mile long! Nice!!! There is also a wooden deck (built and owned by the small Wintony Woods neighborhood) just above the beach, where you can catch a sunset over the water, while enjoying a glass of (your favorite adult beverage). :) Watch closely and you may see the green flash! If you like walking the beach, you can go for miles up or down the beach. Wintony Woods is a great spot for bird watching (two feeders are available if you care to use them), and the pileated woodpecker or red-bellied woodpecker can sometimes be heard and seen along the wooded walks. Numerous restaurants beckon in the nearby towns of Montague and Whitehall, with the Harbour View Grille being well worth a visit. Montague also boasts a Farmer's Market and the largest weathervane in the world. 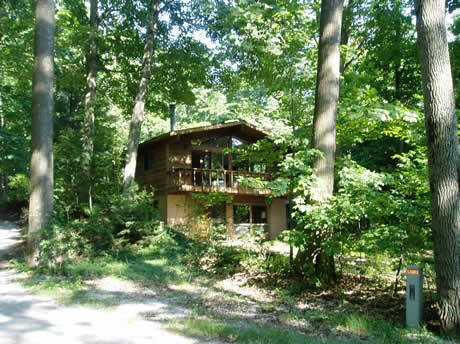 Front View of Cottage in the woods. Wooden walkway down to the beach. Handrails on both sides make it safe and easy. 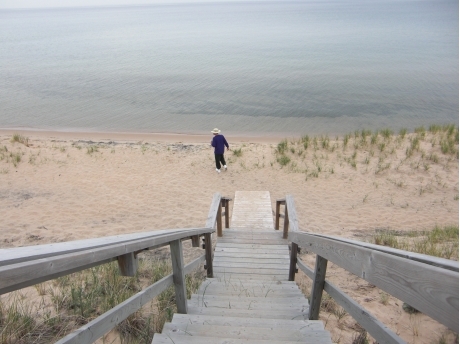 Steps to Lake Michigan 1/4 mile private beach. 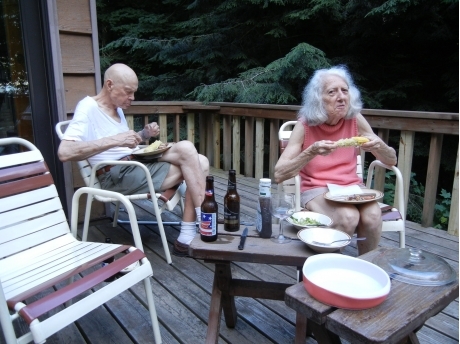 Hang out on the side deck! Beer and BBQ! 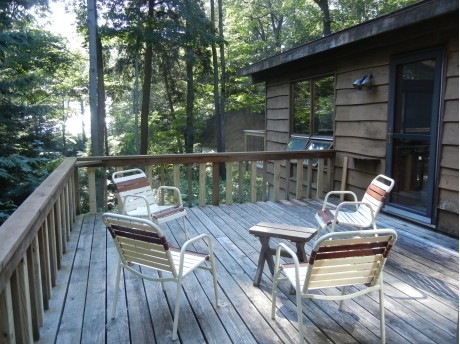 Side deck with view towards Lake Michigan. Watch sunset here at community beach deck. Another view of "new" Florida room. 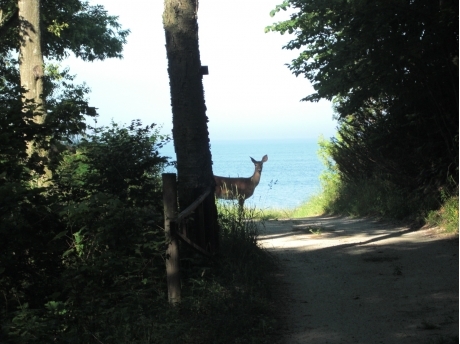 Bambi may greet you on your way to the beach. Transition from woods to beach area. Lake Michigan View From new front deck. Walk-In Apartment Adjoining Entry Hall downstairs. Kids sleep here. East End of Walk-In Apartment downstairs. Same room as last picture. 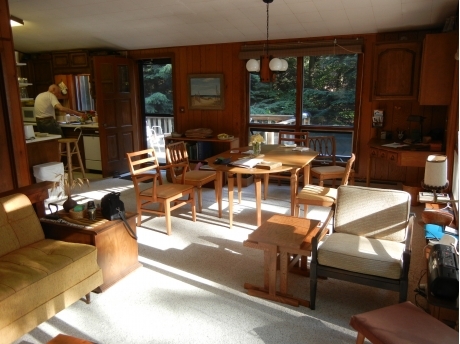 Wintony Woods rental starts Sat. 4 p.m, ends next Sat. 10 a.m.
It’s a lovely place..perfect for decompressing. Especially if you bring your kayak or love to swim, or cycle on the rails to trails. 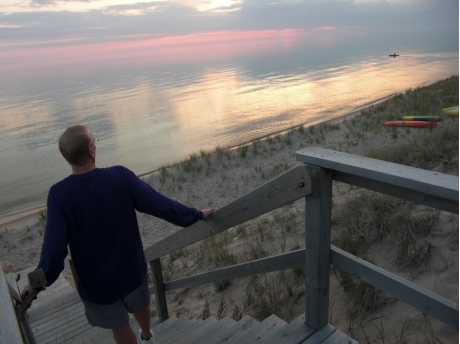 walks on the beach, or love a great sunset, and the wonderful Michigan summer fruits and vegetables, and day trips to quaint Michigan towns, and beautiful rural landscapes, and I could go on. I can't wait to go back.